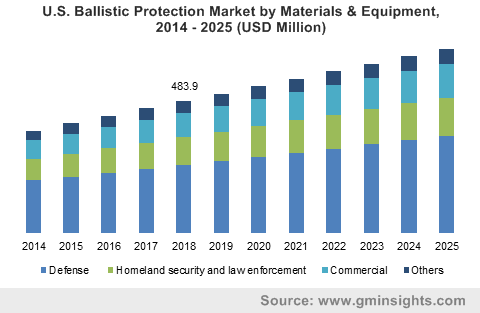 Ballistic Protection Materials & Equipment Market size was valued at over USD 1.7 billion in 2018 and will witness gains over 5.5% CAGR by 2025. Increasing defense budgets in the emerging economies, for instance Asia Pacific is likely to have a significant impact on the product demand, which will help boost the overall ballistic protection materials & equipment market size in the forecast timeframe. Furthermore, increasing terrorism and thereby rising tension between countries across different parts of the globe will also act as a key drivers for ballistic protection market size by materials & equipment in the coming years. Moreover, rising awareness amongst government for active as well as passive safety measures against terror groups to ensure safety and protection of their military, paramilitary and police forces and citizens will help drive the product demand which in turn will make notable impact on the ballistic protection materials & equipment market size in the forecast time period. Stringent regulations laid down by different national and international regulatory agencies against emission of volatile organic compounds (VOCs) is likely to be the key restraining factor, which is anticipated to have a negative impact on the global ballistic protection materials & equipment market size in the near future. 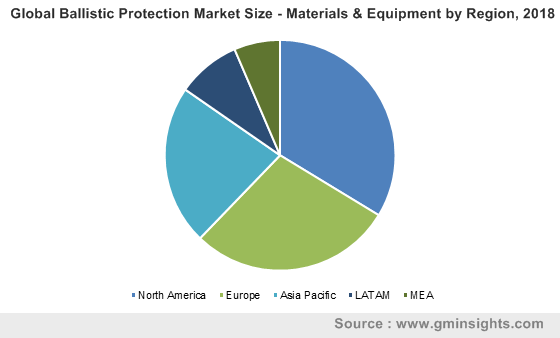 Despite stringent regulations against VOC emission, increasing demand for the ballistic materials and equipment across the globe owing to increasing terrorism and rising awareness about the safety of security forces, is expected to drive the global ballistic protection material & equipment market during the forecast period. On the basis of material, the global ballistic protection market by materials & equipment has been segmented into aramid, carbon fiber composites, glass fiber & thermoplastic ceramic and metal, wool and jute amongst the others. Aramid holds the largest market share and accounted for over 35% of the overall revenue generation in 2018, the segment expected to grow with a CAGR close to 5.5% during the forecast timeframe. Aramid is manufactured from the aromatic polyamides and possess excellent properties including light weight, high strength and flexible nature and therefore it is amongst the most preferred material for the ballistic protection of the border security forces. Kevlar, Twaron, Nomex are some of the renowned brands of the aramid used for ballistic protection materials across the globe. 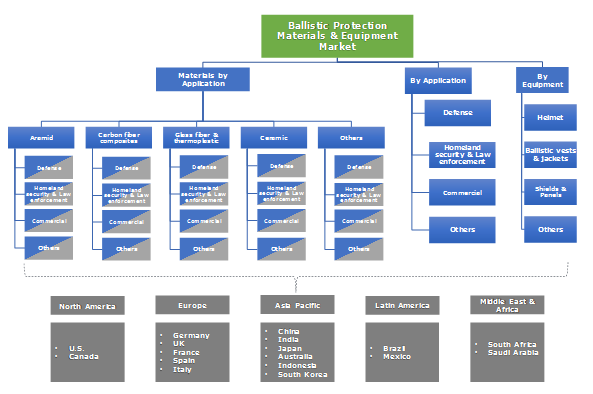 Ballistic protection materials & equipment market is widely applicable in defense, homeland security, commercial, etc. Among all these applications, defense captured a volume share close to 40% in ballistic protection market size by materials and equipment in 2018. In defense, several ballistic protective equipment such as protective vest & jacket, helmet, shields, shoes and gloves are widely used for protection against bullets, knifes, fragments of explosive materials, etc. Ballistic plates, panels, and vehicle armors containing ballistic plates or ballistic panels are also used in the defense to protect the tanks, vehicles, check post, and military offices. Ballistic materials are used in the manufacturing of different equipment which mainly includes helmets, protective vests & jackets, shields and gloves & shoes among others. Ballistic vests and jackets are made of tightly woven fibers with ballistic plate inserted into it. Among all these equipment, ballistic vests and jackets holds the largest market share and is likely to be the fastest growing segment in the near future owing to its high demand for defense as well homeland security and law enforcement applications. The aforementioned trends will help attain promising gains to the ballistic protection materials & equipment market size in the forecast spell. North America ballistic protection market size by materials & equipment attained the largest revenue share and was valued over USD 600 million in 2018, the regional industry size demand is expected to grow with a CAGR close to 4.5 % by 2025. Growth parameters for ballistic protection materials & equipment market in North America is attributed to the high awareness about safety of the security forces and people and the heavy defense budget proposed by the regional government. For instance, military spending in the U.S. was valued USD 610 billion which was about 35% of global military spending in 2014. Asia Pacific ballistic protection market by materials & equipment is projected to witness gains close to 5% over the forecast period. The region will witness significant growth opportunities particularly due to increasing military spending and rising awareness about the safety of military, paramilitary and police forces in emerging economies such as China and India. The global ballistic protection materials & equipment market is high competitive with presence of several large and medium scale players. Major players operating in the market includes Teijin Limited, DuPont, Honeywell International Inc, Texas Armoring Corp, DSM, Homeland Security Group Intl, Protective Enterprises LLC, Armor Holdings, Evolution Armor, Protech Solutions, Inc. Toyobo, Waco Composites, etc. Manufacturers in the market are engaged in R&D to develop innovative and advanced products as well as to increase their production capacity. For instance, Teijin announced about expanding its production of Technora para-aramid fiber by 10% in March 2016. This move was intended to meet the rising product demand and thereby generating higher gains to attain a competitive edge over its competitors. Ballistic protection materials & equipment are used for protection from several kinds of bullets such as rifle bullet, high velocity bullet, knife, fragments of explosives, etc. They are produced from various raw materials which mainly includes aramid fibers, glass fibers, carbon fibers, etc. Current trend in the ballistic protection material and equipment industry involves the production of products with high strength and light weight which makes great wearing comfort and easy usability in different conditions. Gradually, the industry is moving towards the production of ballistic materials and equipment with minimum emission of VOCs to meet the regulatory standards. Furthermore, key players in the market are also focusing on the production of application specific products for instance, light weight protective vests are being produced for the border security forces on the mountain area. Increasing tensions amongst the international boundaries of different countries and increasing terrorism across the globe are major factor factors likely to propel the overall ballistic protection materials & equipment market size in the near future.